Just secretly, behind the scenes, I set myself a few goals for 2015 which I did not share with you, because hello what if I fail? This recipe represents the first of these goals which I have achieved and am now ready to share with you. What was the goal? Perfect a no-bake cheesecake recipe. 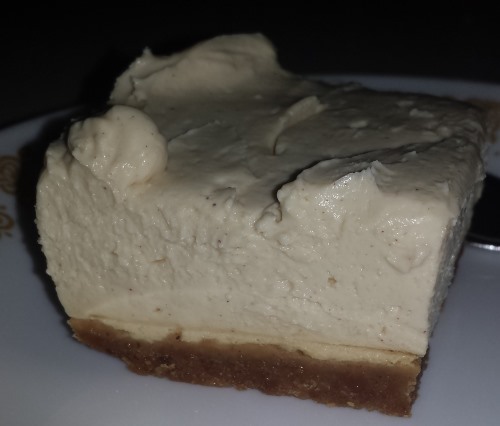 I started with a recipe from The Annoyed Thyroid – Kit Kat No-Bake Cheesecake – you’ll note there is no gelatin which is perfect for me because I am terrible at using it and once I found out what it actually was, I was not a big fan of using it in recipes anyway..
– I also added some cinnamon because I always do. I took it to my parents for dinner and it was hugely popular. We ate it with tinned black cherries and said we thought tinned raspberries would work well with this too.. The one thing we all felt was that the cheesecake part was a little heavy. Then I thought.. could I add more cream to lighten it and would it still set? And maybe I might like a little touch of gingernut biscuit in the base. So cheesecake #2 was created – this time I used 300mls of cream instead of 50mls, and a mix of gingernut and scotch finger in the base. I made it just for us here at home, and it was delightful. It did set, though not quite as well as the first one. I thought maybe I was done tweaking, but never say you’re done, because you won’t be. The next time I made it specifically because family was coming in from interstate, and I used 250g of regular cream cheese, 250g of light cream cheese, and still 300mls of cream. I also used a base purely of Anna’s Swedish Thins – which you should definitely try as a biscuit if you have not, and Ikea make a version almost identical which they call Pepparkakor – these biscuits are fantastic with cheese especially bitey vintage or blue cheese but they are even more fantastic as the base of a cheesecake. This was totally the best version of this cheesecake yet. The ginger from the base seemed to transmute itself into the cheesecake itself, adding an amazing flavour. Done, perfected. I achieved my goal and ate several cheesecakes in the trying, which was awesome. Each shopping trip, I’ve added the ingredients for this cheesecake to our shopping list, and it makes enough that we have a small piece for dessert nearly every night. But then, a happy accident happened when I went to recreate my perfected version. I’d seen this recipe over at Domesblissity – Mini Choc Hazelnut Cheesecake Cups – and I’d bought some spreadable cheesecake, intending to give this recipe a try and perfect it. I was in the middle of making the no bake cheesecake while listening to The Celebrity Apprentice on my cordless headset – the base was complete and in the fridge – when I discovered all my cream was no good. Seriously, this happened on the 26th of January and *two* 600ml thickened cream tubs had use by dates into February. I suspect foul play of some kind and I definitely smelt sour cream. But I had this spreadable cream cheese (250g) in the fridge, and I thought.. ok, give that a try in place of the 300mls of cream. Here now, I present to you, my final no-bake cheesecake recipe. 150g Anna’s Ginger Thin biscuits – 50g Butternut Snaps – ground into a fine crumb. Combine the biscuit crumbs with the butter in a bowl and then press into a baking paper lined baking pan – put this into the fridge to cool while making the base. You can also add 50-300g thickened cream if you like to make it lighter, and the cheesecake will still set. Leave the cream cheese out at room temperature for an hour before you begin mixing for the best results. Mix the brown sugar and regular cream cheese first, until smooth.. Add in the vanilla and cinnamon during this stage. While the mixer is going on a light speed, add in the spreadable cream cheese. Then cut the light cream cheese into small strips and add that in. Mix on high speed for a few minutes until perfectly smooth. If adding cream as well, add that in last. Pour mixture into the lined baking pan with your base. Smoosh with spatula, until presentable. Cover with alfoil or glad wrap and then put this back in the fridge for a few hours, or overnight if you have the time and can resist the urge to eat it. What my next cooking goal might possibly be? And do you like a cheesecake, will you give this recipe a try? 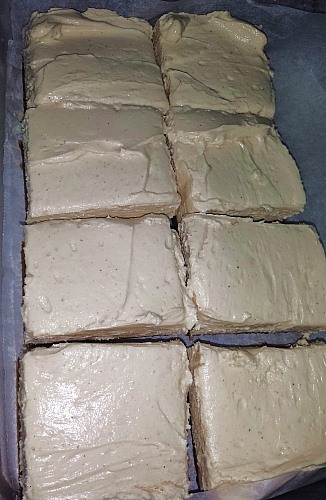 My no-bake cheesecake has Philly cheese, sweetened condensed milk and lemon juice. and the biscuits for the base of course. Sometimes ginger biscuits, sometimes chocolate ripple. Most often it’s the chocolate ripple ones. I’m pretty sure Gelatin isn’t made from horses hooves anymore, there is a plant based version that has been around for years. I’ll have to check on that however. Whatever it is made from, I am epic fail at using it. :) I have even sometimes found whole slices of it in commercially made cheesecakes. So I just think it will be easier to steer clear, and now that I have this recipe there is no reason to use it. I use powdered gelatine for any recipe I have that needs it, there’s not many though. My favourite is a summer dessert called orange fluff, the ingredients are orange juice, honey, eggs and gelatine. I hate gelatin too, the thought of what it’s made from and the thought of how bad I am at getting it to work, both gross me out. 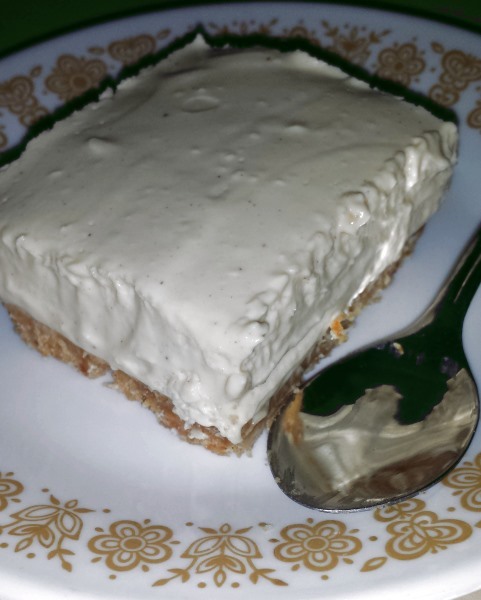 I’ve made other no bake cheesecakes with some added cream, it definitely lightens things up. I love the idea of brown sugar and cinnamon, we’re big fans of both so I’m going to give your perfected version a go when it’s next cheesecake o’clock! I LOVE cheesecake so I might give this a go. I love pepparkakor and had them in Sweden when I visited in 2009. I’m glad you know they go well with blue cheese too. I found an online shop supplying Swedish products to the UK and got some blue cheese cream cheese and bacon cream cheese and they were both delicious with the pepparkakor. Yum! Bacon cream cheese, yum! ;) I usually buy the pepparkrakor from IKEA when we visit but we haven’t been in a while.